The children were withdrawn—all but one of them. “In the evening I came out and saw Manager Davis before the performance began,” Reynolds said. “He told me that if he took off the little Jap the performance would be spoiled. I told him that I did not want to do that but that I was there to see that children under 16 years of age did not appear. Davis had his own side of the story—and he was not alone. Davis complained that Los Angeles authorities waited until the circus was about to leave town before bringing charges, forcing him to pay the fine or remain behind to contest the allegations. Screen Actors Guild information for young performers. 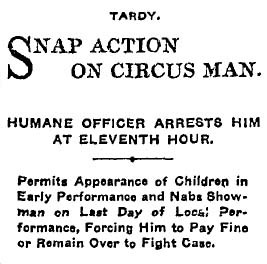 This entry was posted in 1907, LAPD, Theaters and tagged 1907, circus, crime and courts, Gerry Society, Ringling Bros.. Bookmark the permalink. And thus the Outlaw Biker movement was born.